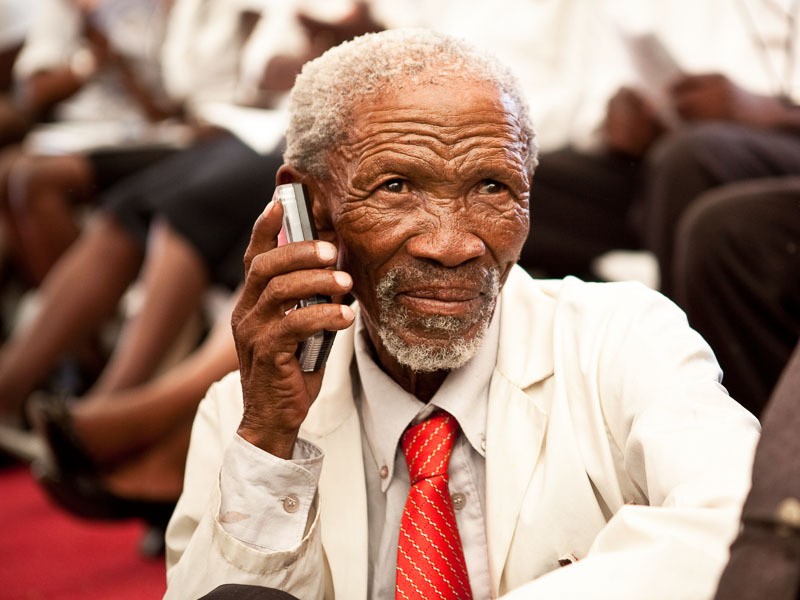 An elderly Khoisan man is delighted to listen to a recording of the New Testament in his own language – Naro. Known widely as the ‘Bushmen’, the Khoisan people’s traditional desert-roaming lifestyle is featured in many movies and they are believed to be not only the original inhabitants of southern Africa but possibly the oldest ethnic group in the world. The Naro New Testament is the very first Scripture to be translated into a Khoisan language and an audio recording was also made for distribution since 95% of the Naro people don’t read but prefer oral communication. Durk Meijer, an Ethnocommunications Consultant for southern Africa, was sitting nearby so helped get this MP3 player going and recounts, “And then when I turned it on and it started to play the language, he put it to his ear and started smiling. It was just like… WOW!” View more images from the Naro New Testament Celebration or read more about audio Scriptures.